I will sign all books sent but if you want it signed to a specific person, please email me through the contact page. Garlic has been close to people’s hearts, minds and stomachs for a very long time. Its garlicky flavour can be hot, spicy and pungent but also sweet and nutty, and the same cultivar may vary widely with soil and climate. This book starts to make sense of the confusion surrounding garlic. Garlic is not just garlic, it is Creole, Rocambole, Purple Stripe, Turban, Silverskin and more. 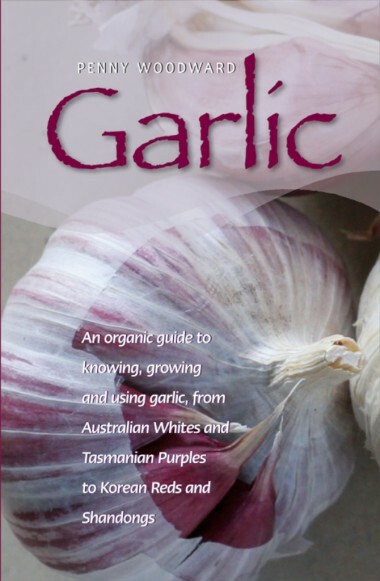 Guidelines for growing organic garlic around the country. Meet some of Australia's growers and find out how and where they grow garlic. Recipes for cooking, preserving and smoking ... and making your own black garlic. An extensive list of growers and suppliers.